The last news about Whatever Works. Watch the movie trailer soon. I'm dying! I mean, not now... Eventually! The words above are pronounced by Larry David, but it's like they come directly from Woody Allen's mouth! Boris (Larry David) sings "Happy Birthday" when washing his hands. Woody Allen is dedicated to explore love and its entanglements, as much on screen as in his own life. 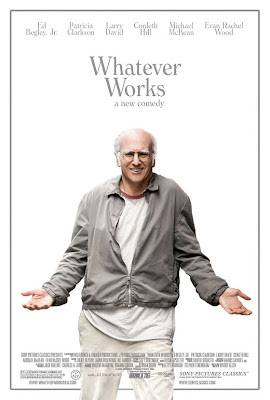 The movie Whatever Works will be released om June 19, 2009. Director Woody Allen goes further in his very special exploration of love and the way it impacts the human condition: he's been working on Whatever Works a new romance comedy movie that definitely shows his signature. The film is starring Larry David, Patricia Clarkson and Evan Rachel Wood. Whatever will premiere at the Tribeca Film Festival in April, before a limited released in June 2009. 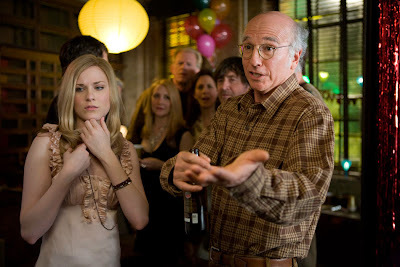 "Whatever Works revolves around an eccentric man (Larry David) taken into a series of adventures and encounters with his friends from Greenwich, a young woman from the South (Evan Rachel Wood), and her parents." Whatever Works marks the return of Woody Allen to New York after a few years spent in Europe. And of course Woody Allen wants to show the real New York and the life of the honnest people who live there. Real people, real world, and a funny twisted story; that's the very fabric of Woody Allen's movies. If you can go to the Tribeca festival don't miss the premiere of Whatever works! Woody Allen and Larry David working together on a movie that's promising. And with a cute girl like Evan Rachel Woods, I can but believe that something good will come from Whatever Works. For an old bald man to score such a pretty young woman must feel like some gift from the sky! Well, for sure some people would raise eyebrows when seeing the couple wandering in the streets of New York. But hey, love is beyond that (especially according to Woody Allen)!